John Frusciante News: Red Hot Chili Peppers will sing on Rock In Rio 2011? Red Hot Chili Peppers will sing on Rock In Rio 2011? The vocalist Dinho Ouro Preto from the band Capital Inicial, said in a question session in the studio Transamerica (Sept. 29) that they will play again on the same night the Red Hot Chili Peppers Rock In Rio in 2011. 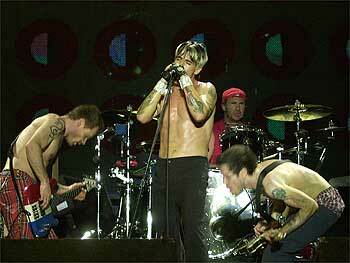 "Rock in Rio: I just know that we will play again on the night of the Chili Peppers. We played 10 years ago, and we'll play one more time with the guys .. and then put 10 years ago was awesome and I hope this year to repeat. It's amazing, these festivals are amazing, briefly answering your question. " The information has not been confirmed by staff of the RHCP and the organizers of the Rock in Rio, but even so it's a good sign, after all Dinho is a big fan of Red Hot Chili Peppers and would not make that comment without a reason. Let's wait.